In a large pan, rub meat with beef rub and put into an 475 degree oven for 45 minutes, fat side up. The meat should start to brown and caramelize. Take out of oven and let rest until it cools to touch. When cooled, take brisket; with back fat still on, wrap meat several times with food wrap. It sounds funny, but it is easier than you think. Put brisket back in pan, open the beer and spread around wrapped item. Reduce heat to 225 degrees and cover pan with foil. 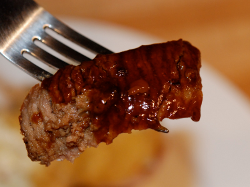 Before cutting, apply Chipotle Honey Hog Alley BBQ Sauce to brisket. Enjoy with pistolettes or your favorite sandwich bread, Cole slaw, and other BBQ accompaniments.